GREE is one of the largest Air Conditioners manufacturer with an annual AC production capacity of 10 million units and founded in 1991. This company has been manufacturing many types of Split AC in 1, 1.5, 2 Ton and more capacities including DC inverter heat and cool, and Floor Standing models etc. Gree AC price in Pakistan 2019 starting from 49000. It is 1st European Compliant Heat and Cool AC available in 11000/12000 BTU, 18000 BTU & 24000 BTU capacities for home and office use. 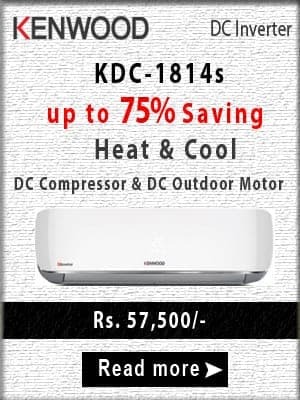 Its latest models 2019 and old models with DC technology saves energy up to 60%. It gives the best cooling experience in some minutes. Some models of AC has a capability of online control with wifi models. So you can control your AC from anywhere in the world. Its some models have an Energy Efficient Ratio (EER) of 3.6 and 4.0. DC inverter Refrigerant is eco-friendly R410A. It’s latest powerful Generation-10 technology is specially designed to produce ideal cooling and stability in all weather conditions. Heating mode gives best heating experience in winters with high-quality compressor made. 12000 BTU AC is ideal for small size room. 18000 BTU is ideal for small to medium room. 24000 BTU is ideal for medium to large room. 48000 BTU is ideal for large room. Fairy, U- Grace, and other models are the best Air Conditioners in the World. Gree AC error/fault codes, (E5, E6, F1, F2, etc) helps you to understand, what problem is causing your appliance malfunction. It comes with 3-years compressor warranty and 1-year parts warranty. This price is valid in all cities of Pakistan including Karachi, Lahore, Islamabad, Faisalabad, Multan, Rawalpindi, Hyderabad, Gujranwala, Bahawalpur, Sibbi, Jacobabad, Peshawar, Quetta, Gilgit. You can buy from different online stores, local shops and dealers in Pakistan. Note: Dear visitors, We tried our best, but we cannot guarantee price on this page is 100% correct (Human error is possible). For 100% correct info. always visit the nearest local shop. We (PriceCity.com.PK) do not sell any product. We only provide specifications, features, and price in Pakistan of different products from different stores around Pakistan.